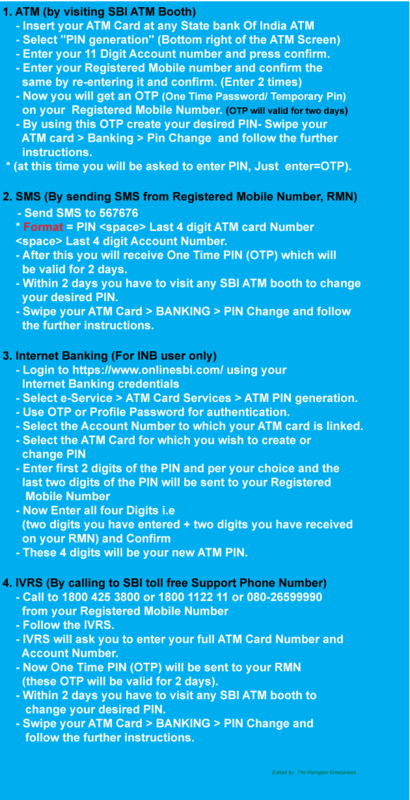 Till October 2016 State Bank of India provided pre-printed ATM PIN that every customers used to collect from their respective Branch after dispatching ATM Card through speed Post. But, from the beginning of November 2016 SBI stopped issuing ATM PIN at all branches. So, due to this sudden changed most of the customers are facing many problems especially those SBI customers who are living in rural areas. As far as I know, no SBI branches have called for public awareness for this particular issue. Ok let it be, I hope that all the SBI staffs are busy for counting money. Without their help you can easily do it by following these steps. This instruction was extracted from SBI users manual. In case if you don't understand kindly whatsap me #+91-8413055427. Thank you for reading my Blog.